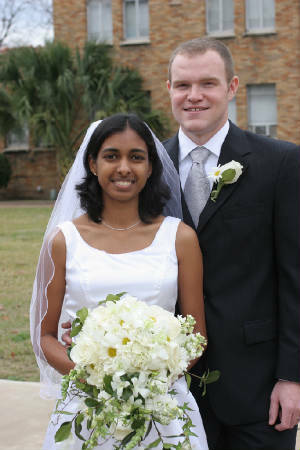 My daughter Somaria (Sumi) married Nicholas Lundgaard on December 30, 2006. This is my toast to Sumi and Nicholas. Hold tight to the toddler who would "read" her story books from the pictures, and whose stories were better than what was in the books. Hold tight to the little girl who organized Christmas Concerts for her cousins, most of whom where older than you. Hold tight to the elementary schoolgirl who learned a poem with the memorable lines "dear little rabbit, I wouldn't harm you"; a performance which brought tears to Daddy's eyes. Hold tight to the teenager who screamed into the phone "Daddy, Daddy, I came eight in the world in Geography". Hold tight to the young adult who was not too grown up to take an empty TV box and make a dolly-house for your young cousin. And that house had windows, and curtains. These are the things which have made you the wonderful person that you are, and which will keep you a wonderful person as you progress through life. I have watched you and Sumi together, and I can see that you have real affection for each other. I wish you wings so that you and your new wife can soar into your most beautiful dreams. Many years ago, my Dad Wilbur told me that I will have one child who thinks like me ... and that would be payback! My daughter Sumi is that child. More often than I can mention I have seen her react to a situation and thought "I would have done the same thing".